The virus & spam filter analyses all emails that are delivered to your email account. It is activated by default when an account is created. If the email is detected as spam, it is automatically moved to the folder called "Spam" on your account. If the email contains a known virus or other harmful content it is deleted. 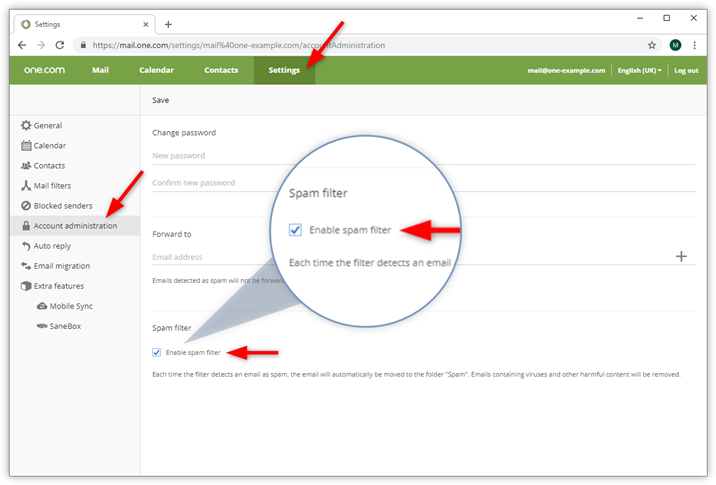 You can enable or disable the spam filter for your email account from your settings in Webmail. We recommend that you keep it activated. Log into Webmail with your email account. Go to Settings, in the menu at the top of your screen. Under Spam filter, check the box to enable it. Note: On mobile, you can find the settings by tapping the menu in the top-left corner and then tap Mail > Settings, also in the top-left corner.